For years now the government has been yabbering on about something called “endogenous development” and the whole time I’ve been scratching my head wondering what the hell that actually means. 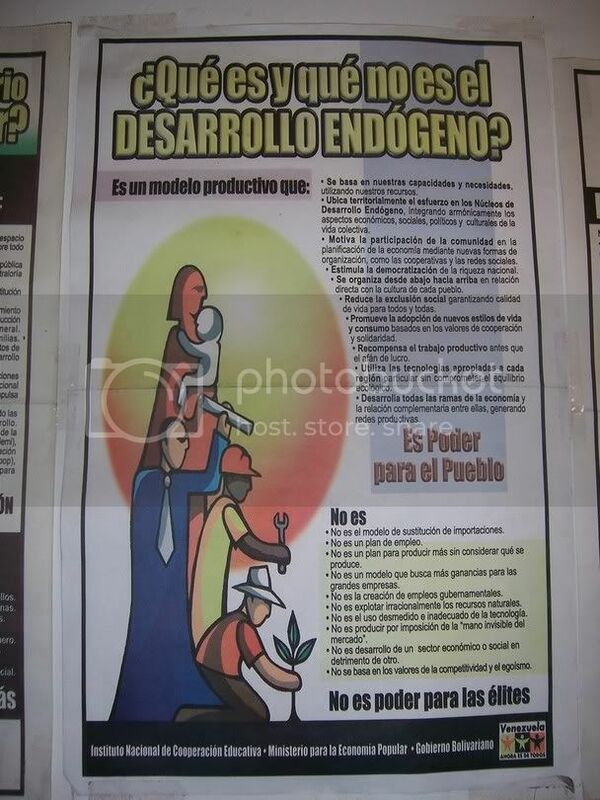 The Chavez propaganda efforts in this regard hardly clear things up: they’re a lot clearer on what “endogenous development” is not than on what it is. Jan. 30 (Bloomberg) — Venezuelan President Hugo Chavez plans to spend $3.25 billion to create 11 state companies that will produce goods ranging from cotton to steel, part of an effort to create jobs and reduce imports. The businesses will include a new state steel mill, an aluminum-laminating company and ventures in cotton, iron ore, mining, cement and paper pulp, Chavez said in a three-hour televised address in Caracas. Chavez said the companies will create jobs while furthering the South American country’s socialist revolution. Venezuela, the world’s fifth-largest crude exporter, imports about 70 percent of the goods it consumes. Chavez pledged this month to invest oil revenue in ventures that would help develop the nation’s industries. Basic Industries and Mining Minister Victor Alvarez said the new companies will create as many as 5,000 jobs. “Many of the products will replace imports,” Alvarez said during remarks before Chavez spoke. The 11 companies will be part of the country’s new heavy industries holding company, Compañía Nacional de Industrias Básicas. The money for the investments will come from a special spending fund of international reserves created by the government last year, Chavez said. The fund has about $7.9 billion in it now, and $5 billion more could be transferred to it this year, he said. Import substitution industrialization (ISI) has been thoroughly discredited as a development strategy for at least 20 years. Venezuela’s experience with ISI was worse than most. The giant ISI projects built in Guayana in the 1970s yielded consistent losses, became hotbeds of corruption, and sucked up huge amounts of money that could’ve been used far more productively. Because of the Venezuelan state’s deep petrodollar-filled pockets, the absence of a hard budget constraint facing state industries is especially prone to generating to massive waste – the government can always afford to keep bailing out failing state industries rather than face the political costs of letting them fail. There’s no particular reason to think that the neopopulist chavistas will be less willing to keep pouring money into wasteful ISI projects than the paleopopulist adecos. In the zero-oversight atmosphere created by Chavez’s practically-embalmed Comptroller General, can anyone doubt that corruption will flourish around these projects? The financing for these soon-to-be money pits will come out of…you guessed it, “excess foreign reserves.” As I’ve explained elsewhere, the concept of “excess foreign reserves” is economically nonsensical. Leaving that aside for the moment, a plan to use “excess reserves” to fund projects inside Venezuela violates the agreement the government had reached with the Central Bank to only spend “excess reserves” for dollar-denominated imports, not for bolivar-denominated domestic spending. Using “excess reserves” inside the country is tantamount to printing money, so the plan is not only bad industrial policy, it’s even worse monetary policy. Our very own OW does a little bit of a back of the envelop calculation and figures out that if you’re planning to spend $3.5 billion to create 5,000 jobs, that works out to a cool $700,000 per job. And that’s IF they manage to hit their budget and job creation targets. Sometimes it seems like Chavez is determined to revive ALL the discredited policies of the past, one by one, one after the other.